With a truly classic look, the Manchester Mail Post adds an authentic architectural element to any home. 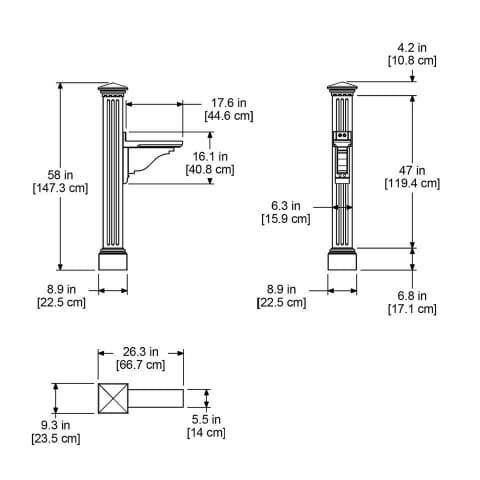 The fluted post design, dentil molding around the cap, and scrolling curve on the support arm combine perfectly to create a beautiful finished product. Mayne’s Mail Posts are crafted from 100% high-grade polyethylene for durability and longevity that will last throughout the seasons. This classic Mail Post fits over a standard 4×4 post to create a stunning look. Included is a large decorative post and mailbox support arm. The Manchester Mail Post serves a perfect and warm invitation to retrieve your mail at the end of the drive, that will never go out of style.